Grab this tool when you need to be seen. A must have when hiking on remote location. An outstanding value is an essential tool for work, personal safety and emergencies, this 2-in-1 LED & Laser Flashlight is guaranteed to light the way! 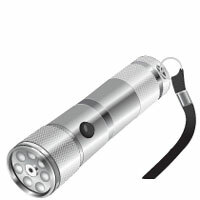 This 2-in-1 laser flashlight features eight ultra-bright LED bulbs and a laser pointer in the middle. Includes push-button on/off switch that allows for sequencing through LED lights and laser. Ideal for camping, fishing, hiking, boating, personal safety, earthquake kit, or just keeping around the house for when you need it. This handy LED tool makes a great addition to your car trunk or toolbox, and also make a great gift for your friends and family! 8 LED Flashlight with Laser pointer.